As more and more consumers demand information about where their food comes from, some are starting to find that traditional farming is not the only source of fresh produce. Urban farms have been cropping up, and many seek to address the needs of the world's growing population that continues to expand despite limited resources. Urban Produce, begun in October 2013, in Irvine realized this issue and sought to provide a solution to the problems of climate, land scarcity, and diminishing natural resources. 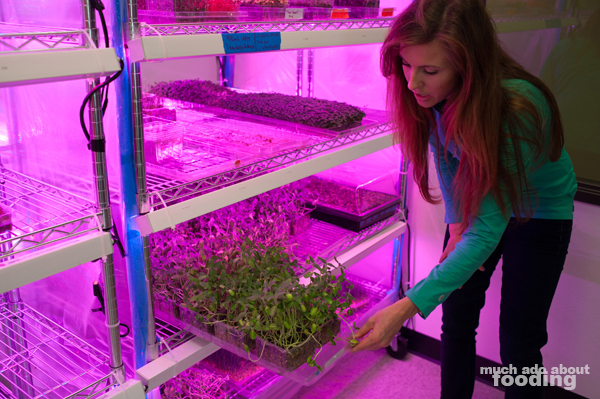 While we may traditionally imagine a farm as sprawling land with rows and rows of crops in dirt, Urban Produce takes a different approach by building up via their High Density Vertical Growing System (HDVGS) and by using hydroponic technology. What does that equal for we the consumers? A certified organic facility of 5,800 ft² in ground space (approximately ⅛ of an acre) and 22 ft vertically that can grow 16 acres of produce in a few days while using 90% less water than a traditional farm. Color us impressed. 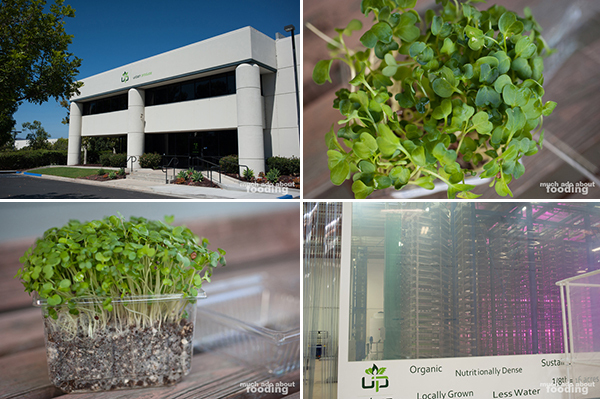 We got to take a tour recently of Urban Produce and see just how they operate. In addition to their advanced technologies and dedication to agricultural cultivation, they are also a family-run business that has grown since its inception in 2013. We spoke with Edwin Horton Jr, President and CEO, and his daughter Danielle Horton, Director of Marketing, on our tour to learn more about how their controlled environment is able to be automated and yield such bountiful harvests. It really is intriguing just how much can be produced in such a space and one that strays from traditional perceptions. 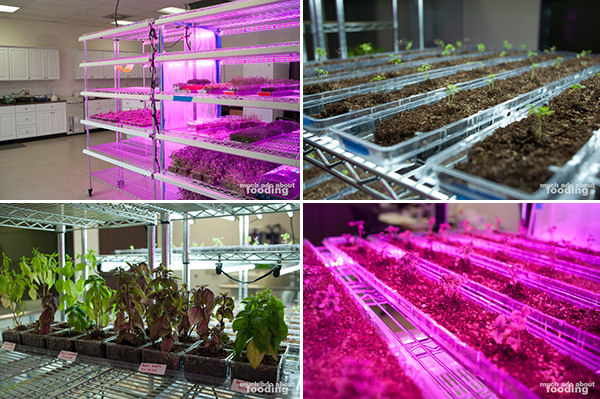 Our tour began with their lab which is used for testing of lighting, seeds, and resource duration. We saw flats testing different basil types and other flats bathing in a sun-mimicking blend of lights. They informed us of the nutrient content per plant as well as best eating/cooking practices to absorb the most nutrients possible. Afterward, we moved on to seed our own clamshell of microgreens, guaranteed to be ready by ten days or fewer after our departure. 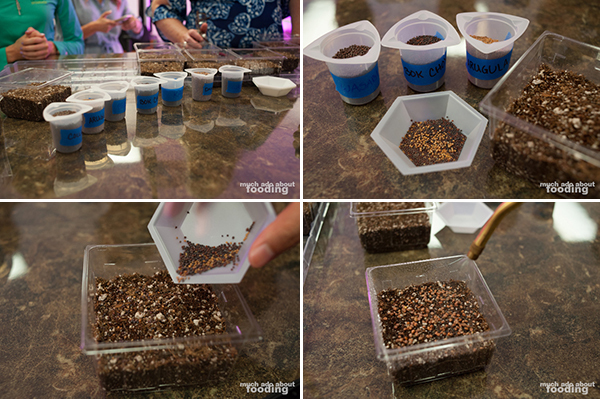 The substrate for our babies was a combination of finely ground coconut core/husk (anti-microbial), peat moss, and other organic components combined to better aerate and provide nutrients to the microgreens. The assembly was simple enough during this hands-on activity, and everyone was looking forward to their end product. 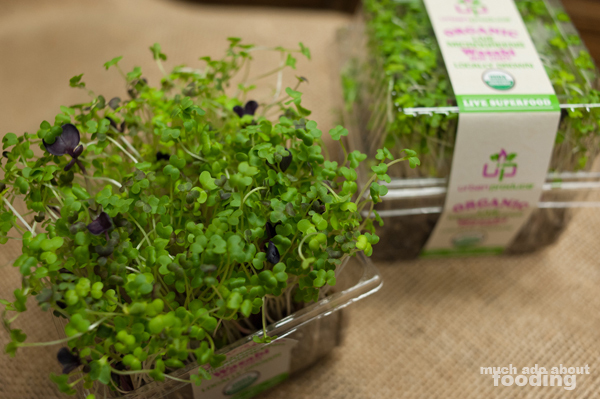 Not only have microgreens been more commonly known among chefs but they are also a strong subject for education on both the consumer and chef sides. 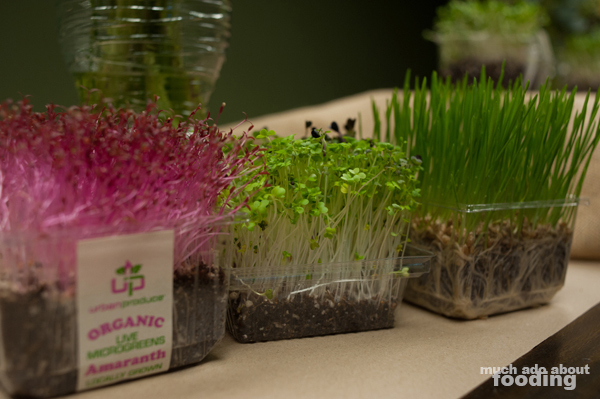 Learning how to care for and harvest the baby plants in their clamshells is a strong priority for Urban Produce's customers and something that the company wishes to educate on. Their most popular retail items are the micro-broccoli and micro -kale products based on recently released research on the nutritional strength in each. Once we saw the HDVGS, we were impressed by how efficiently all of it ran. Moving 24/7 and timed to get the right amount of light at the right time, this system's carriers hit "sunlight" every half hour and are subjected to both water and air at scheduled times. Danielle also pointed out a product in production room which eliminates harmful microbes from infecting carriers. The sheer enormity of the growing system was proof of the many acres they claim to produce; they noted that an order of 3,000 clamshells had gone out the previous week and only taken up the space of 20 carriers in the room. A machine there that collected water from the room's humidity was also installed, boasting being able to create 100 gallons per day just from the atmosphere. Their next goal in making their operations run off the grid and as renewable as possible is to outfit the entire business with solar power. So what do you do with the greens after they've been bought? Cuppa Juicery was present that day and had a few suggestions to share. Their Tropical Kale Breeze Smoothie - microgreen kale and mango, cold-pressed pineapple juice and coconut milk - was a hit with the group and sounded simple enough to put together. 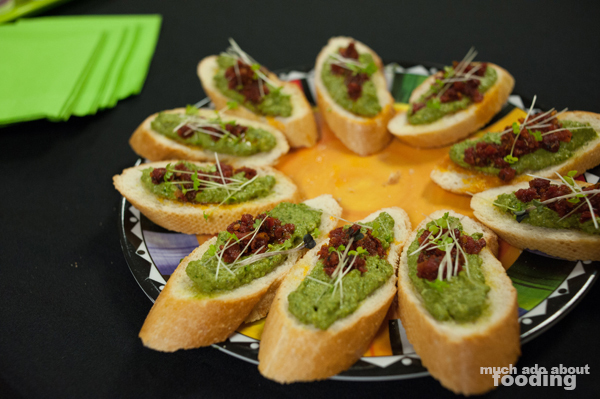 Next was the Microgreen Pesto and Sundried Tomato Bruschetta featuring organic sunflower, arugula, and broccoli microgreens, a good demonstration of how to make a flavorful topping to crusty bread. 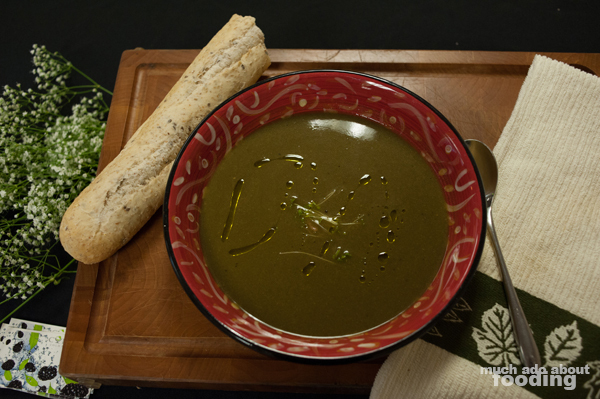 There was also Green Velvet Soup with Lemon and Cayenne featuring organic broccoli and kale microgreens that warmed the stomach but did not sit heavily. 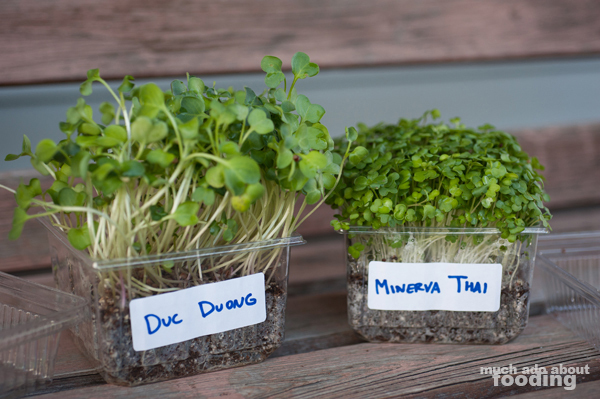 Because microgreens are nutritionally dense and strong in flavor, these dishes were great showcases of how to use them in creative ways that are still desirable and not too out of the ordinary. After finishing the tour with samples of ways to use the microgreens, our next exciting part of the Urban Produce experience was to retrieve the ones we had planted and use them. 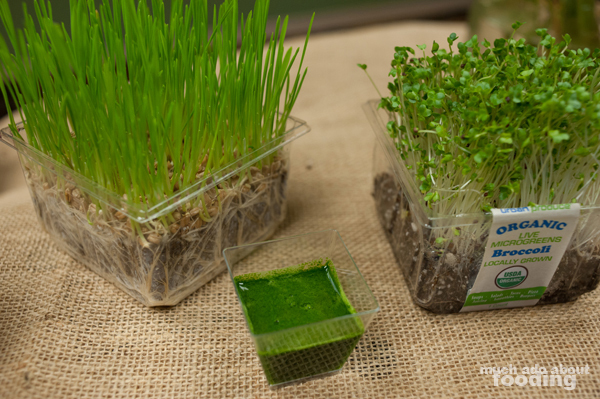 Within a week, ours had already sprouted and were speedily on their way to become strong, healthy plants. 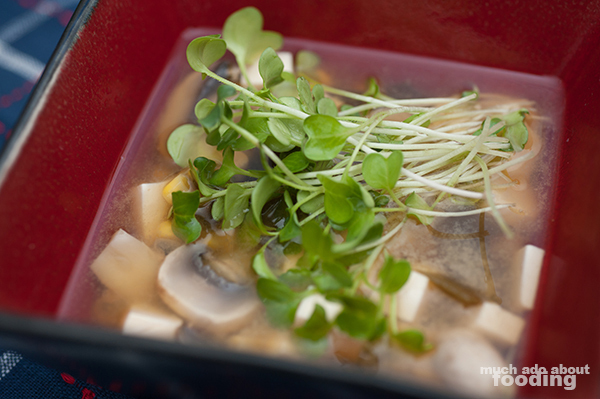 We picked them up and used them in a variety of ways including on a white miso soup composed of mushrooms, tofu, and corn. 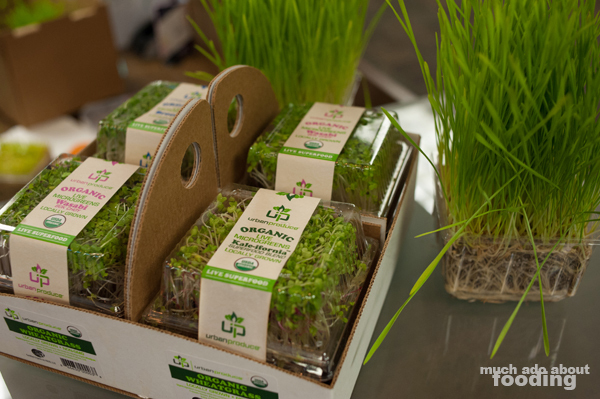 As more and more people become exposed to the variety of produce out there, it won't be long before microgreens potentially become a regular part of consumers' diets. Not only are they tasty but they are also able to be grown in innovative ways that can combat the challenges that traditional farms are facing today. 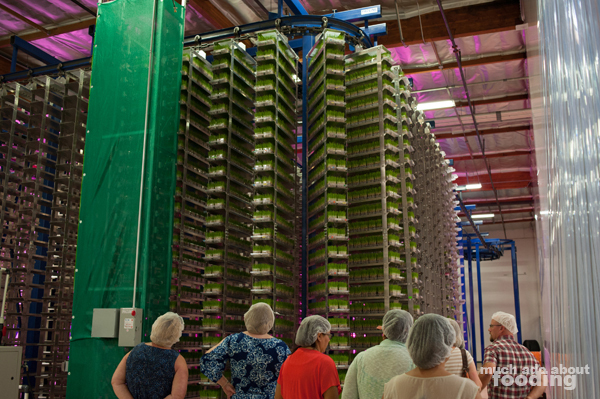 Seeing how Urban Produce operates was an eye-opening look into what is being done about feeding growing populations, right here in our own county.